Unfortunately, I won't be able to clip during the show, but never fear, we will be getting some clips up tomorrow for you to enjoy as you nurse your hangover -- er, I mean, as you wake up to a new year and a clean slate of time waiting for all manner of exciting things to happen! Okay, on with the party! Let's make some noise! So long to 2009 and the Naught Decade, Hello 2010! Happy New Year, everyone! One final one from Sharon... thanks again! hi everyone not sure if I'll be able to come back online to wish you all a Happy new year when it's actually 2010, so I want to wish you all a Happy New Year! May 2010 bring you all many blessings. I want to thank everyone for a great blog. Since I only joined about a month ago (but, I had been reading it for about a year) I've really enjoyed the clips, pictures, intelligent comments and information about AC. Wishing you all the best for 2010!!! Hope everyone has a safe and fun NYE. Thanks to Cyn for taking on the live blog....I'm sure she'll be firing up the Anderblue martini fountain soon. Enjoy the night and Happy New Year everyone! Happy 2010 to all on the blog and its posters. John and Kyra seem to be "enjoying" themselves as well. I wish Anderson would have Reza Sayah on the show, his coverage of Iran and Pakistan has been excellent. I'm trying to watch the show online, but can u tell me whether Anderson is already up? Coz the streaming I am getting ryt now doesn't have him on yet. Isabel, where are you? Happy New Year! Anderson and Kathy were just on again, and Kathy seems ready to cross a lot of lines tonight... Hopefully she isn't drinking, things might get ugly! Anderson is holding an umbrella and has remembered his gloves this year. Just turned on CNN and saw AC checked in. Glad to see him safe and sound with that giant umbrella and cute red sweater. Kathy is still annoying. 15 more mins. Happy New Year Everyone, not quite 9:00 here yet. Looking forward to Anderson and Kathy and wondering if she's already written that check! Wow, Anderson is having quite the time of it dealing with Kathy! 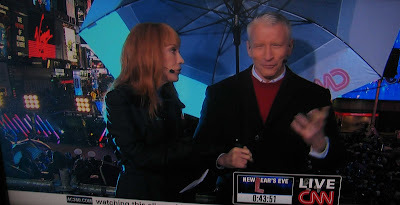 Kathy Griffin is such a waste of time, why on God’s green earth would CNN have her back year after her?? Ryan Seacrest had on Jennifer Lopez & she will be ringing in the New Year with Ryan, unlike CNN. Kathy Griffin has no class what so ever!! 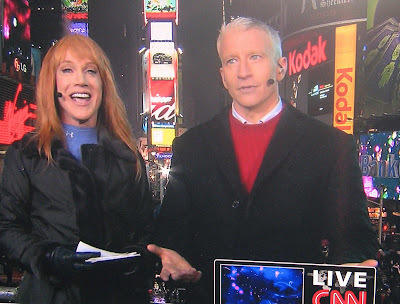 Cyn - Nobody can control Kathy Griffin - not even poor Anderson!! Only ten minutes in and Kathy is comedy gold. This is the first time I watch AC and KG ... and frankly, I don't like it... She doesn't make me laugh. Anon@11:08, I hope Anderson gets to complete at least ONE full sentence tonight! Anderson has just returned from Namibia, West Africa. This whole spectacle must be so surreal for him, after having spent two weeks there!! Griffin is right about one thing, we at ATA will be downing several Blue Martinis just to drown her out!! I must be weird--but I like Kathy--she is crackin me up!! Hope everyone is having a fun New Year's.I like this live blog. Anderson & Kathy are good together but it would be nice if Anderson could finish his sentence for once. Or is it just me? They have just started. LOVE that photo of her and John King on a bed! @Isabel – the reason why Anderson can’t stop laughing is probably ‘cuz he’s trying to keep his sanity while trying to keep Kathy under control. BTW Happy New Year to you!! If I remember correctly you are in Brazil, aren't you?? Way to go!! Health, Happiness and Success to you in the New Year!! Happy New Year everyone!!! Hope 2010 is a great year. Is it me or is the show not as good as it normally is? I mean I like it, but its just not as good. My husband and I went out for a nice dinner but that's all we do for New Year's Eve. I can't comment on Anderson or Kathy Griffin because of the Three Stooges marathon on AMC. DH loves the Three Stooges. I love Gary and his daughter is so cute. He looks like he'd be a great dad! Can't say I miss the musicians this year. They should all win an Emmy for this show. My ribs hurt from laughing so hard. I do hope CNN now realize what a mistake it was having her on & don’t make the same mistake next year!! 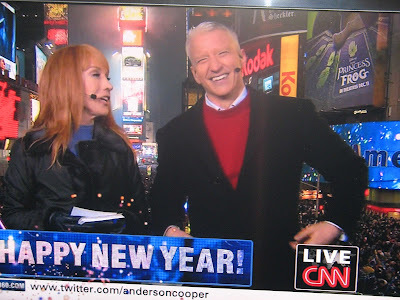 I do appreciate the shoutout Anderson gave to the Troops in Iraq, Afghanistan & across the globe!! I do hope they bring more messages from our Troops!! Nobody deserves it more then those folks who sacrifice their lives for our freedoms!! Gary's daughter Samantha is the cutest & bravest 12 year I’ve seen in a long time!! P.S. Jennifer Lopez is on ABC performing if anyone is interested!! I think we all want more Anderson. It's great that she is there to make him laugh, but still. Okay, he finally got a chance to talk. Glad he got a new mattress! Thanks! Happy New Year to you too !!!!! Yes, I'm in Brazil !!!!! I redeem myself ... AC and KG is fun!! You do a great job on this blog. I am not enjoying the show. Anderson can't get a word in. Did I hear him right that he said he needed to lose about 8 pounds? I think he looks like he has lost weight. I can't believe Anderson just read that tweet! I'm kinda glad. YES!! !Way to Go Bill!! Well said!!! WOW!! Checkout those crowds!! Unbeleivable!! Wow. Anderson reads ONE tweet, and chooses that one. Maybe we aren't the only ones annoyed by the fact that he can't say anything without her trivializing it. Thank you, Bill, whoever you are! Hey, even if I loved Kathy Griffin, I'm here to listen to Anderson. HAPPY NEW YEAR, EAST COAST! It would be cool to be there just once. Maybe we could all have an ATA field trip! Happy New Year to those on the East Coast!! What a fun party, Cyn! HAPPY NEW YEAR!! To ALL ATA Fans and Friends!!! Thanks for a Great Year!! Hope 2010 is as exciting, adventurous for each & every one of you!! Continued Health, Happiness, Success and Prosperity to each of you & your families!! May every one of your dreams come to pass in 2010!! Happy New Year Cyn and everyone on the east coast!! Well that was interesting...so weird out here, all the NYE celebrations are over on TV and we still have an 1 1/2 hours to go! BTW I am loving Anderson in that Red Sweater. Just love Gary Tuchman's and Samantha is a doll. What an interesting NYE celebration for John Zarella's family...oh and his son is quite the cutie! LOL Bonnie, I have been wanting to feed that man for years! He looks even more slender in person, don't know where he thinks those 8 pounds are hiding! Cyn, you have done a fabulous job as usual and thanks to all for the pretty pic's! I watched part of the show. I had to switch back and forth to other New Years shows. I like Kathy, but for some reason she was annoying the hell out of me tonight. I found the show rather dull this year, quite frankly. Em I agree--Anderson looks great in red. I'm in the midwest, so I have 30 more minutes until New Years! Yea Gary & Samatha--good job!! Happy New Year everyone and good night! In 2010 we can have so much fun, much more !!!!! Peace to all! Happy New Year to you! I'm an hour behind NYC - so strange to watch when it's not 2010 here yet!! Thanks for doing this -- great job. 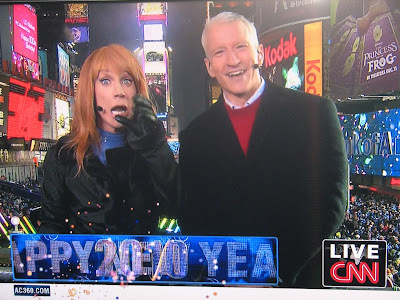 I can't stand Kathy Griffin but put up with her once a year to watch AC! Well going to say good night and go prepare a little NYE celebration for Mr. and I. Hope all of you have a safe and happy New Years. Oh and for those of you with southern roots, don't forget your blackeyed peas and greens tomorrow/today! Happy New Years my ATAT friends! KG tries to be funny, but no way! At least the night was fun! 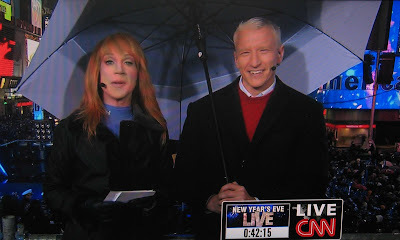 I love Kathy Griffin and I think she and Anderson are great together. You can tell he loves her. It was a lot of fun tonight! Happy New Year to my Central Time Zone friends! I enjoyed watching "Andy" and Kathy. I laughed sooooo hard. I hope they do it again next year. Oh and I hope they bring Poppy back...she is SPUNKY!!!! Tedi B. I love it when you blog, but I must disagree with you about KG. IMHO AC laughs because if he didn't he'd probably lose it all together. She is a total distraction and like the e-mail he read and he read it in a serious tone, she interupts constantly and doesn't allow him to finish a sentence. No wonder he doesn't party afterward. He's totally exhausted from trying to control her. He does seem to enjoy Kelly. Happy New Year to all. Loved KG and AC. He seems to have such fun with her. I wish they could have them on for the West Coast NYE, but I'll take what I can get. As always, thanks to all who work so hard on ATA!